You may remember the stunning piece from Brian Li and team last year entitled Still Life Comes Alive, which portrayed thousands of pieces of paper which were folded and glued together to form the sentence which literally and perfectly illustrated itself. 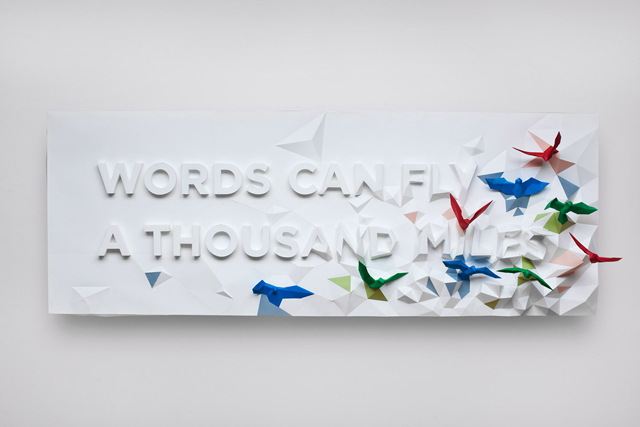 With their more recent piece, 'WORDS CAN FLY A THOUSAND MILES' the focus behind the project is to provide an aid to people in Fukushima, Japan suffering from the aftermath of the natural disasters and nuclear plant crisis that occurred last March. They created this three dimensional typographic poster out of paper as a poster which represents their hope that the words and messages can encourage Japan during this difficult time. Brian Li, with the help of fellow teammates -- Sean Yendrys for art direction, design from Dominic Liu, Duc Tran and Stefan Spec, and creative direction from Kyosuke Nishida, have created a typographical installation of epic proportions that was exhibited in the FOFA Gallery hallway-vitrine for the Concordia University Design Department End of Year exhibition, during the Montréal Design Portes Ouvertes 2010. 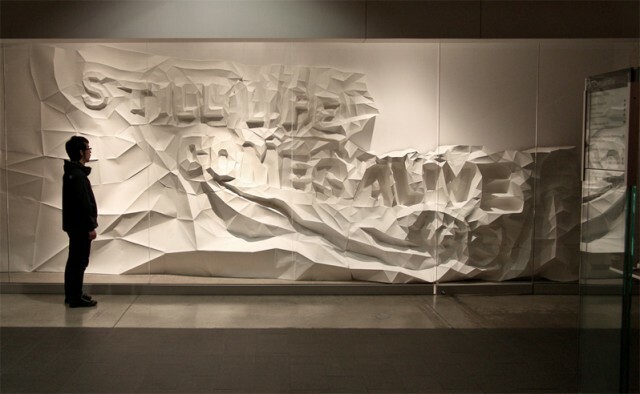 They assembled thousands of pieces of paper which were folded and glued together to form a sentence which literally and perfectly illustrates "Still Life Comes Alive".